Research on what older people value and what works in care homes and other settings identifies eight important themes. The first three themes are focused on how to individualise and personalise care (Personalisation themes). The next three are concerned with how to support people navigate through the journey of care (Navigation themes). The last two themes are aimed at managers to help staff put the other six themes into practice (Transformation themes). These evidence based themes are derived from research on quality of life, quality of care, and quality of management. Importantly, they integrate learning from health, social care and housing. 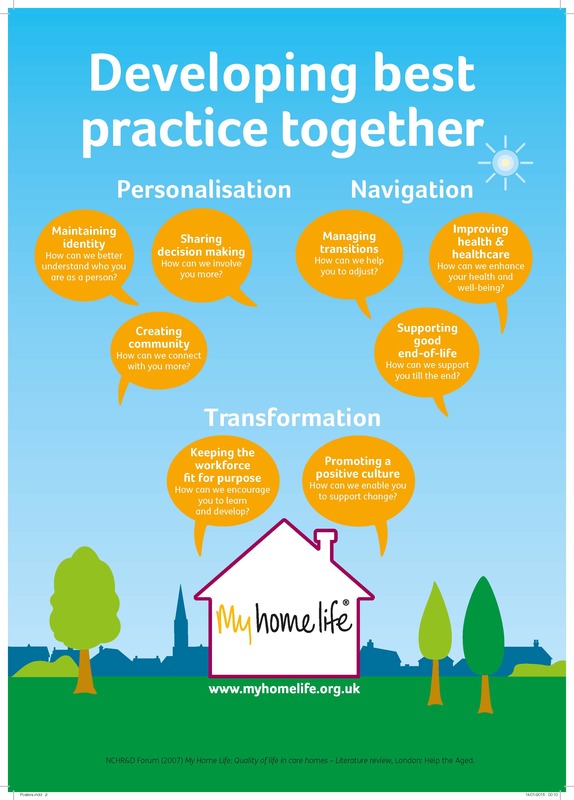 The My Home Life Vision is underpinned by Relationship Centred Care and the Senses Framework, which is a framework for improving care of older people through promoting positive relationships. It highlights the importance of not only meeting the needs of residents/clients/people who use services, but also addressing the needs of relatives/friends who visit and staff who work in care settings. 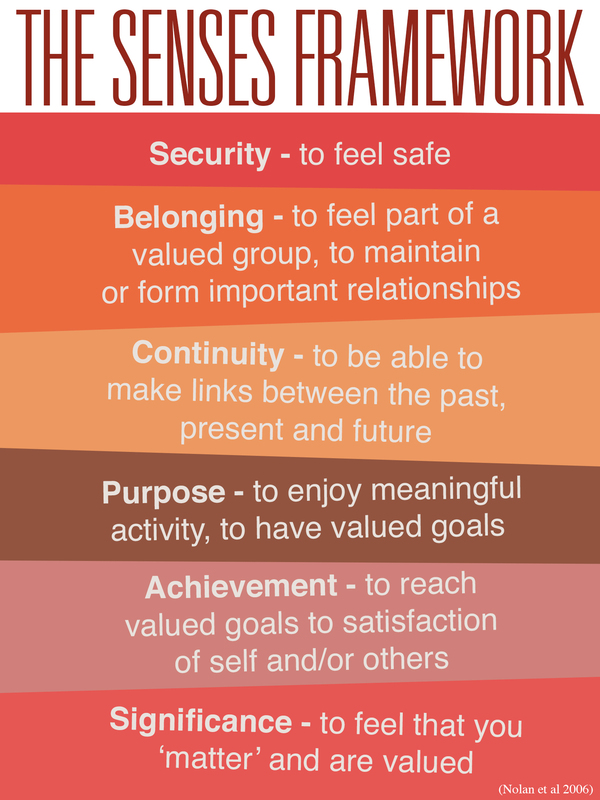 To achieve good relationships and quality of life for all in this context, it suggests we need to consider what gives each individual a sense of security (feel safe), belonging (feel part of things), continuity (make connections between past, present and future), purpose (have goals), achievement (moving towards their goals) and significance (matter as a person). Paying attention to these senses can help us identify the individual needs and personal outcomes for residents/clients/people who use services, relatives and staff. 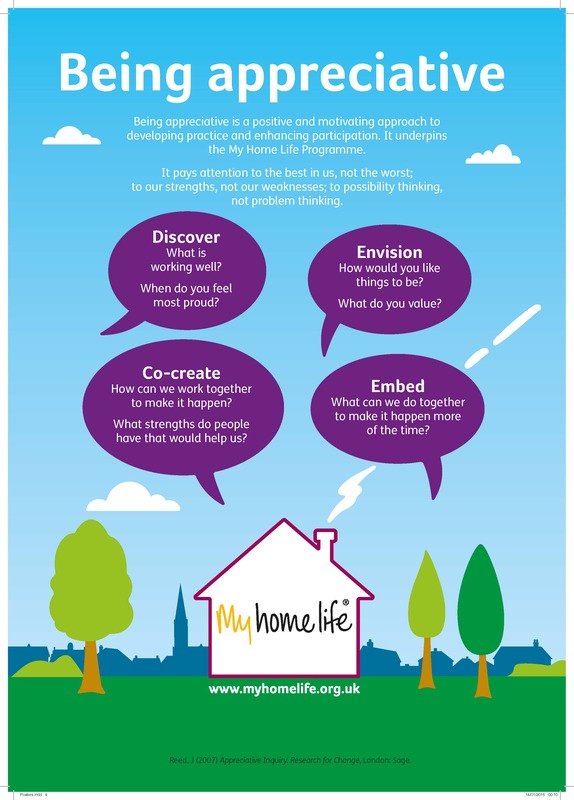 In My Home Life we use the Senses Framework to help make visible the contribution that staff, residents/clients/ people who use services and relatives can make to the creation of a caring environment; we emphasise reciprocity and the need to create a care culture in which all participants are meaningfully involved. In My Home Life we have found that these principles are equally applicable, whether taking forward a large-scale development or working with individuals in the moment. The notion of being ‘appreciative’ has sometimes been misunderstood as deflecting attention from difficulties or harsh realities. This is not the case. Instead it works with people’s values, respecting hidden stories of experience and personal narratives, demonstrating a sensitivity to feelings. As a process for supporting development, it can be transformational through establishing trust, authentic connection and a different quality of learning. The approach can be used to explore and develop a wide range of topics. The approach is also used to shape our everyday interventions and practice. Developing best practice together, focusing on relationships and being appreciative depends on meaningful dialogue and interactions. The Caring Conversations framework enables this to happen by enhancing the way we engage with each other. 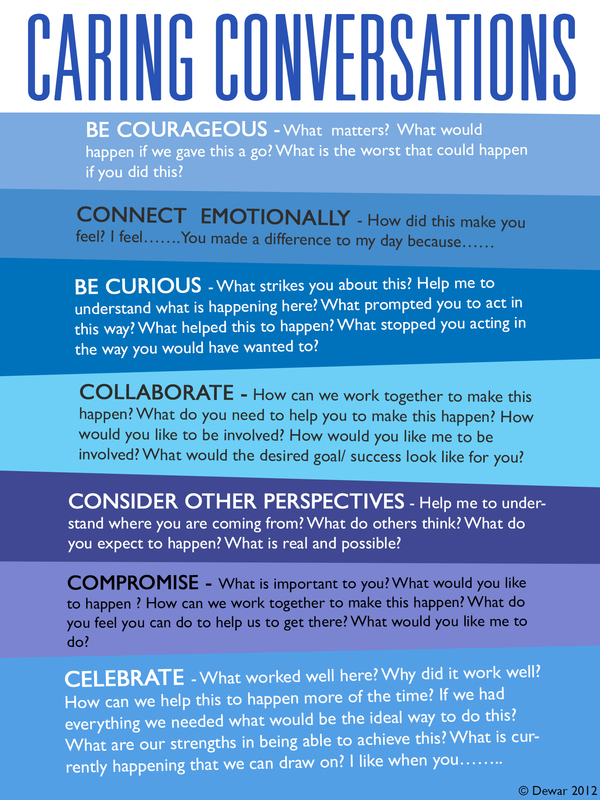 The framework suggests that, in order to deliver compassionate and dignified care, people need to Be Courageous, Celebrate, Connect Emotionally, Be Curious, Collaborate, Consider Other Perspectives, and Compromise. Within My Home Life we have found that the framework helps to encourage and sustain genuine curiosity for ourselves and others, deepen inquiry, explore values, articulate tacit knowledge, and acknowledge and express emotion without dispute or judgement. It also supports a different attitude to risk-taking and devising new approaches to problems. Ultimately, it enables people to acknowledge achievements, encourage better listening and so make room for more contributions to enhance quality of life for all.